Recent release “1611: Christianity’s Reboot, and the Advent of Western Civilization” from Page Publishing author Alan J. Greczynski examines Western Europe’s advancements before, during, and after the dispersing of the KJV Bible. It is a civilizational handbook that explains an operating system for society and how civilization was built. Alan J. Greczynski, a retired maintenance technician in the US Postal Service, veteran of the US Coast Guard and National Guard, and recipient of a Masters Degree in Military History from Norwich University, has completed his new book “1611: Christianity’s Reboot, and the Advent of Western Civilization”: an academic piece written in an easy to understand style. It presents arguments that post-Jacobean era Europe owes a debt to this king of Scotland and England, King James, for his efforts to rebrand the Bible as a book for the masses, rather than keeping it reserved for the clergy and aristocracy. In terms of its effectiveness and exposure, Greczynski draws a parallel between the KJV Bible, and another iconoclastic piece of literature. Published by New York City-based Page Publishing, Alan J. Greczynski’s research posits some worthwhile questions surrounding the similarities between Mao and James. 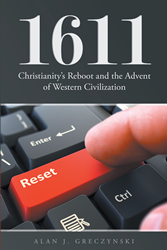 Readers who wish to learn more about this challenging subject matter can purchase “1611: Christianity’s Reboot, and the Advent of Western Civilization” at bookstores everywhere, or online at the Apple iTunes store, Amazon, Google Play or Barnes and Noble.